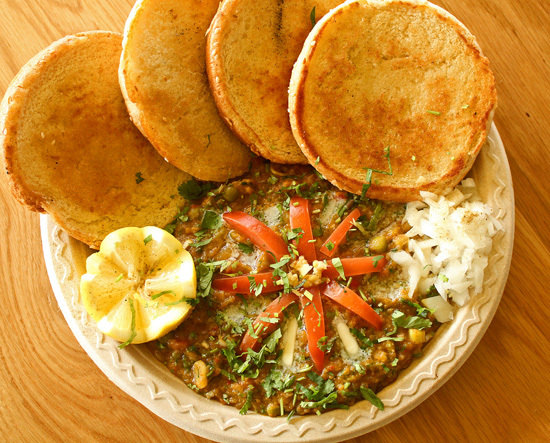 Our Indian Street Food Cooking Class on Thursday, April 11 6:00 – 9:00 at the Holy Nativity Community Hall will introduce you to some traditional Indian delicacies that you can make easily at home. Guest Chef Zenith Gebhardt, a member of the Holy Nativity Community is a natural at combining spices and creating delicious food from her homeland in India. Zenith and I visited the Samosa House in Culver City in preparation for our next Cooking Class called Indian Street Food. Last year, Zenith shared some of the secrets of Indian cooking at our Foods of India class, combining and cooking the spices that this land is so famous for. We made a plate of traditional Indian dishes – Saag Paneer, Chicken Curry, Tarka Dhal, Vegetable Pilau and Baingan Ka Bharta along with some Mango Lassis. Not only do I enjoy these dishes at restaurants, but when I make them at home, my house smells amazing from all the spices roasting in my skillet. 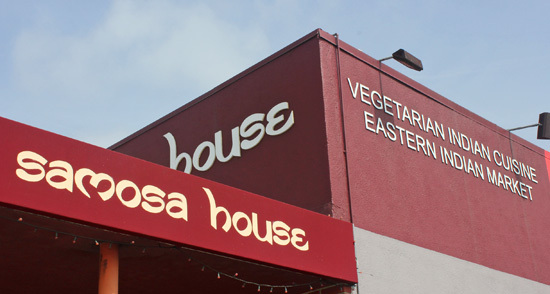 Pav Bhaji, Samosa House. A vegetable based dip or stew to eat with bread. This year Zenith will share recipes for favorite street foods and quick bites from the Indian repertoire. Aside from Samosas, these dishes were unfamiliar to me, but I fell in love with them while we sampled them at the Samosa House at 11510 W. Washington Blvd in Culver City, CA. Now I am looking forward to learning and sharing how to make these dishes at home with ingredients available at the Samosa House. Cooking Class fee $40 when you reserve by April 8, $45 at the door. To reserve your spot, email Patricia@FreshFoodinaFlash.com. Then write a check to “Fresh Food in a Flash”; mail it to Holy Nativity Episcopal Church, Cooking Class, 6700 West 83rd Street, Westchester, CA 90045. or contact us to arrange payment by credit card. Entry filed under: Cooking Class, Indian, Vegetarian, WordPress. Tags: cooking class, Indian, pakora, samosa. The success of an Indian recipe seems to also rely on the right blend of spices. Thanks for posting.